Fabric...it cures whatever is ailing you - Stop staring and start sewing! The two lucky winners of the Flirt fabric stacks are Laura, who left a comment on 3/01/09 at 8:03 am, and Amber, who left a comment on 3/03/09 at 11:33 am. Congratulations ladies!!! I loooooved reading everybody's plans for the fabric and all the wonderful ways it could change your life! I was really enjoying the claims that this fabric would cause an improvement in personal hygiene, family harmony, dramatic weight loss, and best of all, bring about world peace. Fabric is truly amazing, isn't it? Some commenters were like "well, it's not going to really rock my world or anything like that but I like free stuff so whatever...and besides, I never win anything any way". ("can you pin my tail back on now please?") Hehe. I love reading about how many people are working on quilts for soldiers, and orphans, and other beautiful causes. I swear, people who love fabric are the nicest people in the world! We are making really good progress in our re-model here. Joey got the drywall up on each side of the new wall after he totally wired the room for electric outlets and cat 5 wire (that's nerd lingo for computer cables). He's trying to finish his fish cap because he really wants some blog attention but I've kept him too busy with our project (somebody's got to crack the whip here. Snap!). 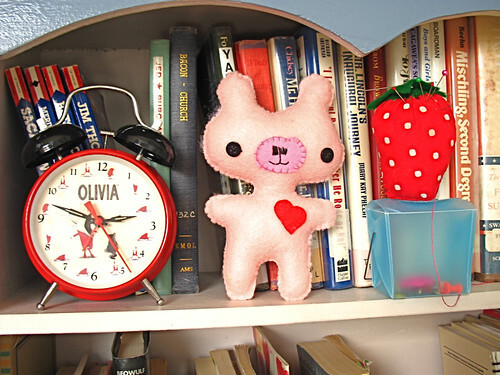 Olivia made this adorable softie out of felt using this free pattern. Super sweet! And I love the heart. 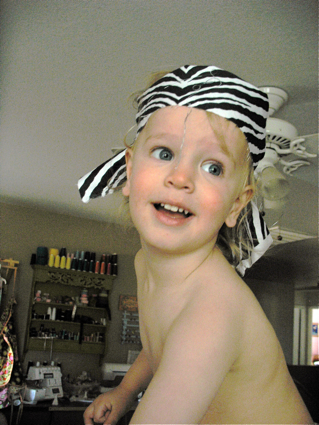 And yes, unfortunately I'm out of the Zebra prints from Jennifer Paganelli's Flower Power line (but I'm getting more!). So if that makes you angry, you can take it out on the culprit who took the last of it. "Dude, Woodstock was like 40 years ago. Get past it. And put a shirt on." And the kids have discovered a new favorite past time. 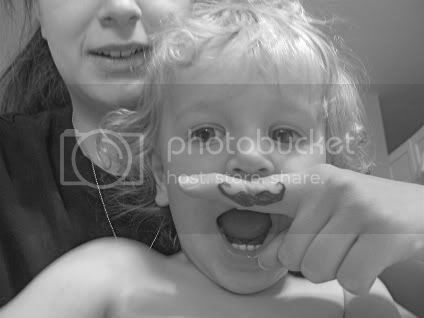 They draw little Hercule Poirot mustaches on their fingers and share them. We went out to dinner after church with friends and this kept the kid's table so quiet (except for the giggling). Try it next time you have to wait somewhere with the kids but don't have anything to distract them with (you just need a pen, oh and a finger). Snazzy! !